After years of painful budget cuts, new revenues will begin to flow to California school districts in 2014. Thanks to the voters’ approval of Proposition 30 and the adoption of the Local Control Funding Formula (LCFF), nearly all districts can expect budget increases over the next several years. Districts that educate the most challenging students will see the largest gains. When the LCFF is fully implemented many schools and districts will receive 50 to 75 percent more revenue per pupil than they do now. The implementation of LCFF invites education leaders to look forward to 2020 rather than back to 2007 as they think about budget priorities. The prospect of steadily increasing revenues over several years makes it possible to think big about what they aim to accomplish for their students, and to develop long-term strategies for their schools and school districts. Being strategic rather than reactive in the implementation of LCFF is the key to long-term improvements in the performance of California schools and students. Decisions about LCFF implementation should be guided by a vision of where the district aims to be in 2020, based on evidence and developed in consultation with teachers, parents, political and business leaders and community members. The political pressure to raise salaries, restore programs, and reverse budget cuts is naturally intense, but a unique opportunity will be squandered if LCFF revenues are used only to backfill cuts or fund miscellaneous pet projects. Realizing the vision will require the establishment of clear and measurable goals for addressing specific problems and supporting specific groups of students. 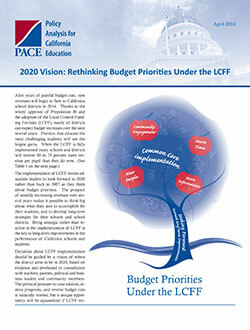 In this report PACE offers guidance on research-based strategies for LCFF implementation. We begin with three key principles that in our view must guide any long-term strategy for improvement in California’s education system. We then identify four key areas for the investment of new resources where research suggests that additional spending can produce real gains in the performance of schools and students.